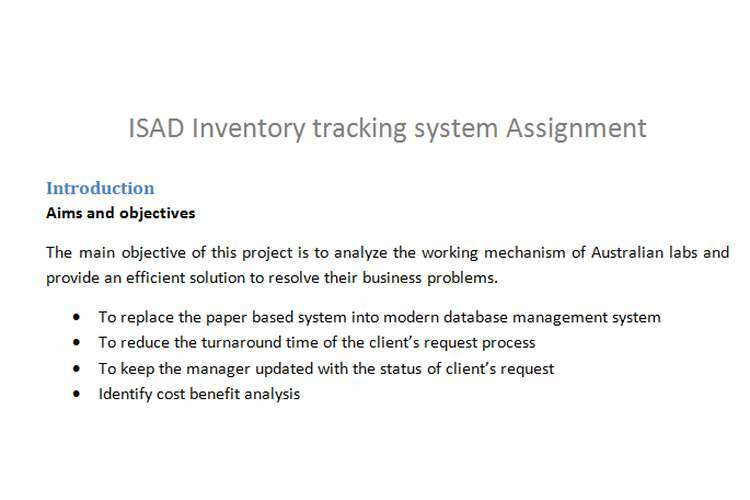 The main objective of this ISAD Inventory tracking system Assignment project is to analyze the working mechanism of Australian labs and provide an efficient solution to resolve their business problems. We have analyzed the case study and thought of a database solution that keeps the track of the clients (doctors and medical offices) associated with our labs. We have also maintained a diagnosis table and treatment table that are linked with lab and clients table. To keep track of customer’s test request we have maintained two attributes as diagnosis_request time and report_generated time which will help Jim to maintain an up-to-date status of the inventory system. In this approach all the requirements will be predefined and required low technical risks.The best example of predictive approach is waterfall model.The best example of predictive approach is waterfall model. Phases of waterfall models are project planning, analysis, design, Implementation and testing and support. Adaptive: Adaptive approach provides more flexibility and considers that planning for project is not considered on the basis of assumptions. This approach may create uncertainty during development of database and offers high technical risks. Spiral model is the best example of newer adaptive model. Phases of spiral model are planning of iteration, analyze and design and test and integrate. Project Planning: Prepare a rough idea about a specific project with goal and duration of project. Analysis: This phase helps to gather information which will help tofind Problem and their solution. Design: This phase provide detail explanation of solution with integration, design of application architecture and integration of databases. Testing: This phase help to verify and test the solution, train users and install system etc. Maintenance and support: This phase provides maintenance to the solution, repairs, updates and help etc. It is used to create and manage the database. SQLite is a database engine which codes are freely available for both the commercial and private use. A Microsoft access is a database development engine which creates Database application. It is a relational database management system which is a most trusted and widely used RDBMS engine. It is an open source RDBMS and all source code off PostgreSQl are available free. It not able to create a text file it only manages the database of the system. Required special commands to create tables. Not able to create text files. No special command is used to create table, text file, forms etc. It will not able to create text file as Microsoft access. It will not able to create text files and forms as Microsoft access. It provides multi user and multitasking environment to work in parallel so the authentication process to the database is no more secure. SQLite database engine is worked on android platform. More validation and authentication can be added. Fewer authentications can be applied. It creates a user friendly database which is easy to use by technical or non-technical users. It is most widespread and trusted database on which we can apply very strong authentication. It is a popular database creator engine used to create web applications. Extra software installation is required. Yes we can use Microsoft access database engine which is a very user friendly database. No special command line is used to create forms and tables. To create table and forms just click on to the available option and rename it. Inventory tracking information system: The developed system is able to track and manage the information of inventory of the labs. Keep track of customer test request: It is able to track the request regarding the various test sent by the customer. Provide accurate status updates and turnaround system: The system provides the accurate status of recent updates and turnaround in the system. Cost benefits analysis: The system is planning to design well so that it cans analysis the cost benefits of lab by tracking the inventory information. Reliability: The MS access is the relational database management system; it combines the database engine known as the JET, report design, form design, visual basic, and graphics for the custom program execution. So the developed system is reliable. The cost benefit analysis is performed in order to identify the total cost incurred in developing the system and the benefit received with sales. We have assumed the initial cost as 80,000 and deducting the recurring cost (25000) from it. The benefit company gets in the first year is 15,000. Eventually as the year passes, the company will be in a profitable state but as of now the growth is steady and neutral as you can see in the excel sheet. The work breakdown structure can be described as a hierarchical decomposition of the system into modules. With this approach we have divided the development task of the system into modules. The WBS is somewhat an organization chart that defines the scope of the project and connection of system with its modules. Whereas a Gantt chart is a bar chart that specifies the number of activities performed with respect to time and we have defined each activity performed while developing inventory tracking information system. They both are related to each other as the Gantt chart can be drawn from WBS as the branches or modules of WBS become the tasks of Gantt chart arranged in sequential manner. The time duration is added with the tasks. Yes, the above schedule is feasible, justified and reasonable because the work breakdown has been done keeping in mind the modules, timescale, cost, and resources required for the implementation of proposed system. The weeks taken (2 months) and the division of tasks are correlated and the project can be successfully completed within the specified timeframe. The stakeholder involve in the developed inventory tracking information system are: clients (doctors, offices and the small medical business throughout the country), lab technician, head technician, database designer and developer, etc. All those who involves in the collection and transporting of blood samples. Clients (doctors, offices and the small medical business throughout the country). Interviewing and Listening: This is a type of techniques which is used to collect the information during the analysis. It is used to discover the views of users for the target and current system by individual talking with the users or as the group of users. In this technique we carefully preparing an interview outline and guide before the interview start. Administering questionnaires: This technique involves designing the questionnaire and also determining who should respond to it. It is mainly used when too many key users are present to interview individually. All the person presents in the interview have to answer the same question roughly. Directly observing users: This technique involves watching how the people work in order to uncover the information, users may not be aware of direct observation is best when detailed or complicated procedures must be documented. All the techniques are good and best in use to collect the information during the analysis process. According to me the interviewing and listening information collection technique is the best technique to collect the information. In this technique everyone can put their views individually and independently about the targeted and current system in the interviews. All these techniques are better in used to collect the information from the users in the analysis phase. These three techniques are commonly used in collecting the information, and also help a lot in the information collection process. Each of these techniques are used the questionnaire and individual observation and interview of users which helps us to collect a large no of individual and independent views and information about the targeted and current system. So people can prefer to use these techniques for collecting the information. Questionnaire helps to collect data quite quickly. All the users can be given the opportunity to provide the feedback. It allows each user to put their views and anonymous feedback independently on their own experience. It allows a large number of users for feedback, where it is impractical to collect the views and feedback using other more resource intensive techniques. The proposed system will help the Australian labs to resolve the issues caused due to the existing system. The lab will eventually get benefitted with the strategy applied and system implemented. The costing will be there but its worth from future perspectives. prezi.com. (2016).Unit 11 Systems Analysis And Design - Assignment 1. [online] Available at: https://prezi.com/rtgrdrwaajme/unit-11-systems-analysis-and-design-assignment-1/ [Accessed 6 Aug. 2016]. Marketpath.com. (2016).Custom vs. Off-the-Shelf Software | Digital Marketing Insights | TheMarketpath Web Digest. [online] Available at: http://www.marketpath.com/digital-marketing-insights/custom-applications-vs-off-the-shelf-software [Accessed 6 Aug. 2016]. Projectsmart.co.uk. (2016).Relationship between WBS and Gantt chart - Project Smart. [online] Available at: https://www.projectsmart.co.uk/forums/viewtopic.php?t=1746 [Accessed 6 Aug. 2016]. Chandoo.org - Learn Excel & Charting Online. (2015). Doing Cost Benefit Analysis in Excel – a case study. [online] Available at: http://chandoo.org/wp/2015/01/28/cost-benefit-analysis-in-excel/ [Accessed 6 Aug. 2016]. GCFLearnFree.org. (2016).Access XP: Seven Steps to Good Database Design (Part 1) - Page 1. [online] Available at: http://www.gcflearnfree.org/accessxp/seven-steps-to-good-database-design-part-1/1/ [Accessed 6 Aug. 2016].